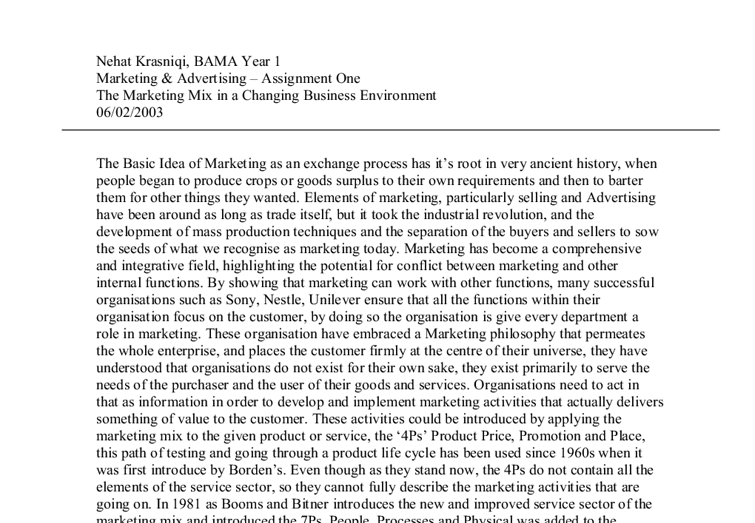 Nehat Krasniqi, BAMA Year 1 Marketing & Advertising - Assignment One The Marketing Mix in a Changing Business Environment 06/02/2003 The Basic Idea of Marketing as an exchange process has it's root in very ancient history, when people began to produce crops or goods surplus to their own requirements and then to barter them for other things they wanted. Elements of marketing, particularly selling and Advertising have been around as long as trade itself, but it took the industrial revolution, and the development of mass production techniques and the separation of the buyers and sellers to sow the seeds of what we recognise as marketing today. Marketing has become a comprehensive and integrative field, highlighting the potential for conflict between marketing and other internal functions. By showing that marketing can work with other functions, many successful organisations such as Sony, Nestle, Unilever ensure that all the functions within their organisation focus on the customer, by doing so the organisation is give every department a role in marketing. These organisation have embraced a Marketing philosophy that permeates the whole enterprise, and places the customer firmly at the centre of their universe, they have understood that ...read more. Marketing Managers tend to approach decisions about adverting and other forms of promotion in tow different ways one is choosing the right Marketing Mix and the other is introducing the right Promotional Mix. Combining the tow essential formulas to any product will be determined by the marketing managers decisions on choosing the right steps, and generating the right life cycle for the product or service. How product or services are presented to customers, under the promotional mix sometimes includes matters like visual design and packaging. But primarily the methods of communication with customers, these could include, personal selling, Adverting, Sales promotion and Public relation each of these has its advantages and disadvantages but their relative importance varies with the particular case. The marketing manager needs to understand how markets develop over time, in order to introduce a new product to the market positioning and targeting will first go through their life cycle and their marketing strategies, to determine whether the product will have some success in growing competition. But most products are in fact dynamic, almost living things, they are developed as concepts, prototypes, they will be launched in the market. ...read more. Marketing managers need to also understand the growing implications of Information Technology within their planning when launching a new campaign. In the marketing context Technological advance can be generated from two main sources as far as the marketing manager is concerned, the first source is external to the organisations and perhaps even external to the market, thus technology developed for other purposes, academic, medical etc. And the second source of technological advance is market driven, by organisations searching for specific solution to specific marketing problems. In the other hand launching an Advertising campaign through the promotional mix, has become more sophisticated, advertising has gone beyond Television, Radio, Cinema, Newspapers and magazines. Even though these services remain in full complaints with agencies, other communication services have emerged through Information technology comes the Internet, Mobil, Credit/Debit Cards, this has given agencies the possibility to define their target audience and launch a more effective campaign. Readings: 1. John Wilmshurst and Adrian Mackay , The Fundamentals of Advertising 2nd Edition 2. John A. Murray and Aidan O'Driscoll , Strategy and process in Marketing 3. 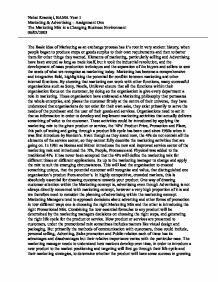 Frances Brassington and Stephen Pettitt, Principles of Marketing 3rd Edition 4. Leslie Butterfield, Excellence in Advertising ...read more. or tie in with TV advertising to remind people of the TV message. Point of sale (POS) advertising includes posters for the shop window, complete window displays for the advertiser's products, 'Open' and 'Closed' notices for the door with a product name on them, and the various other small advertising items that you see in shops. Another issue was that of matching the Maximo advertising budget, by spending some of their new larger budget on the new brand they would not need to match the budget. They could instead leverage some of their brand image and not have to try to inundate the market with advertising. Although you still see the newspaper being advertised in retail outlets throughout the United Kingdom and Republic of Ireland, this is far less popular than advertising through television networks and the Internet, where radio advertising has also been ignored to focus on new media technology. POLITICAL - * Government * Laws * Tax Policy Theses can define the way the company is run, and the informal and formal rules that the firm must follow to stay a legitamate business. ECONOMICAL - * Inflation * Economic Growth * Interest rates These can affect the capital of the company, the purchasing power of the potential buyers. * The changing health consciousness of the market could have a serious affect. Both Coca-Cola and Pepsi have already diversified into above markets, allowing them to have further significant market shares and offset any losses incurred due to fluctuations in the market.